4 TBS cold butter, cut into pea-sized pieces. 2. In a baking dish, toss the sliced fruit with the sugar, spices (optional) and vanilla (optional). 3. In a large bowl, sift together the flour, 2 TBS sugar, baking powder, and salt. 4. Mix the butter into the dry ingredients until it looks like cornmeal. 5. Make a well in the middle of the flour mixture, and add the egg and milk. Mix with a fork until the egg is beaten and then start to incorporate the egg-milk well with the flour mixture, until a soft dough forms. 6. Dust a cutting board with flour and roll out the dough on the board to about 1/4 inch thick. You can cut your biscuit dough into fun shapes with cookie cutters or into circles with a drinking glass. 7. Lay the biscuit shapes on top of the fruit, and sprinkle with an additional teaspoon of sugar. 8. 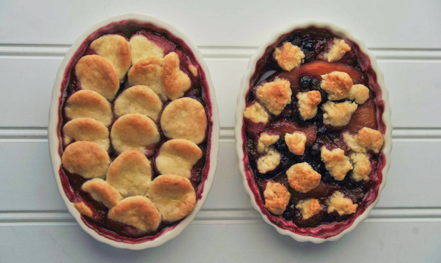 Bake for 25-30 minutes until the fruit bubbles, and the biscuit topping is golden brown! Quick tip: instead of rolling out your biscuit topping, you can spoon it in dollops onto the fruit mixture directly from the bowl. Make it your own: Try mixing 1/2 cup rolled oats into the biscuit mixture, and substitute brown sugar instead of granulated. Try mixing 2 TBS raisins and 1 TBS brandy or bourbon into the fruit mixture before topping it with the biscuit mixture. Serve with vanilla ice cream, whipped cream, or yogurt mixed with honey.